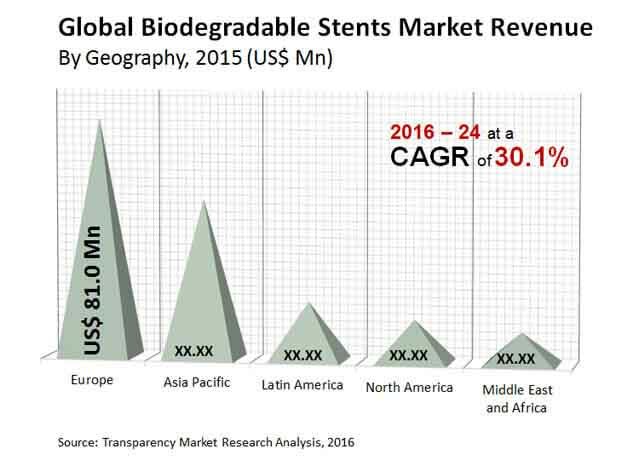 The global biodegradable stents market, in terms of its competitive landscape, is expected to continue showing a consolidated nature over the coming years. The companies Biotronik, Boston Scientific, Inc., and Abbott Laboratories, led the global biodegradable stents market in 2015, through a wide array of diverse products and a generally high reliability quotient. The above three names held a whopping 61.5% of the global biodegradable stents market in 2015, thanks to their infallible research and development efforts. Their expansion strategies have also allowed them to retain their leadership in the global biodegradable stents market. Meanwhile, over the coming years, the market is expected to show a greater deal of investment in the more sophisticated products and technologies. As stated in a research report recently published by Transparency Market Research, the global biodegradable stents market is expected to expand at a CAGR of 30.1% within a forecast period from 2016 to 2024. The market was valued at US$18 mn in 2015 and is expected to rise till US$1.7 bn by the end of 2024. The CDC had stated that nearly 370,000 people have died of coronary heart disease in the U.S. alone, per year. “The global biodegradable stents market has been expanding at an extremely swift pace within this context of growing CVD patients, and not just in developed economies, but emerging ones as well. The demand for biodegradable stents – which was till now considered a relatively niche branch – is witnessing an even greater upsurge in demand. Biodegradable stents are being considered a highly rated option due to the fact that they are easier to implement and get completely absorbed into body fluids, which makes it highly convenient for patients as well,” states a TMR analyst. The global biodegradable stents market is one of the markets related to the overall stenting procedures in the world that as a whole is witnessing an extremely high rate growth in demand. The demand and preference for stenting procedures is also expected to surpass conventional bypass surgeries due to their relative ease of use, further giving the global biodegradable stents market scope of growth. In comparison to bypass procedures, stenting procedures are faster, cheaper, and allow the patient to heal faster and lead a much healthier life during recovery. In terms of geography, the global biodegradable stents market is distributed into North America, Europe, Asia Pacific, the Middle East and Africa, and Latin America. The report states that Europe is expected to arise as the dominant region in the global biodegradable stents market over the coming years. Europe is expected to surge at a CAGR of 27.2% from 2016 to 2024 in the global biodegradable stents market, a growth rate primarily attributed to the high demand and government support shown for the market in Germany. Although the global biodegradable stents market is showing a high growth rate, it is currently being restrained by the high cost of the most product offerings. As a result, the rewards of using biodegradable stents are getting overlooked. The high pricing of these stents is expected to restrain the overall market’s growth in the coming years. Furthermore, the slow adoption rate of these stents in regions and countries where medical awareness is relatively low is also hampering the progress of the global biodegradable stents market.